If you do not butcher your own beasts, it can be hard these days to access some of the sections that are not considered main stream to Australian taste. The “other” parts of any animal these days are often sold overseas or used in products that may be unrelated directly to food. 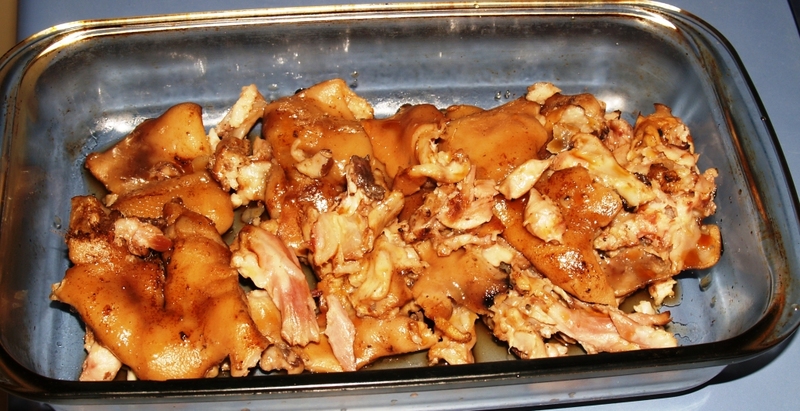 In other cases they are not economical to do anything with which is where pig feet may lie in the mix. It will depend on your local butcher as to what can be sourced. Ox heart is readily available although you may find it somewhat off putting to locate in the pet food section of the meat cabinet at the supermarket. I have found a way to make this nutritious cut quite interesting and tasty to my taste at least, as reported previously. Brett Goodwin from Tewinga Natural Produce is part of a trend in Coffs Harbour to bring fresh meat to your door. He, like a number of other specialist outlets, does a run around businesses, delivering superior quality meat he has produced himself. The service is friendly, helpful, efficient, clean, reliable and you can ask questions and request cuts that are not mainstream. This led to a request for pigs feet or pork trotters, to give them a go..
“Grab your pig’s feet, bread and gin, there’s plenty in the kitchen. I wonder what the poor people are eating tonight?” said Fats Waller, legendary jazz pianist and hard man. As an aside, he was once kidnapped by the Al Capone mob and delivered to a venue and ordered to play. He was a hit. Filled with alcohol, cocaine and surrounded by a bevy of beauties he lasted three days before being returned home. 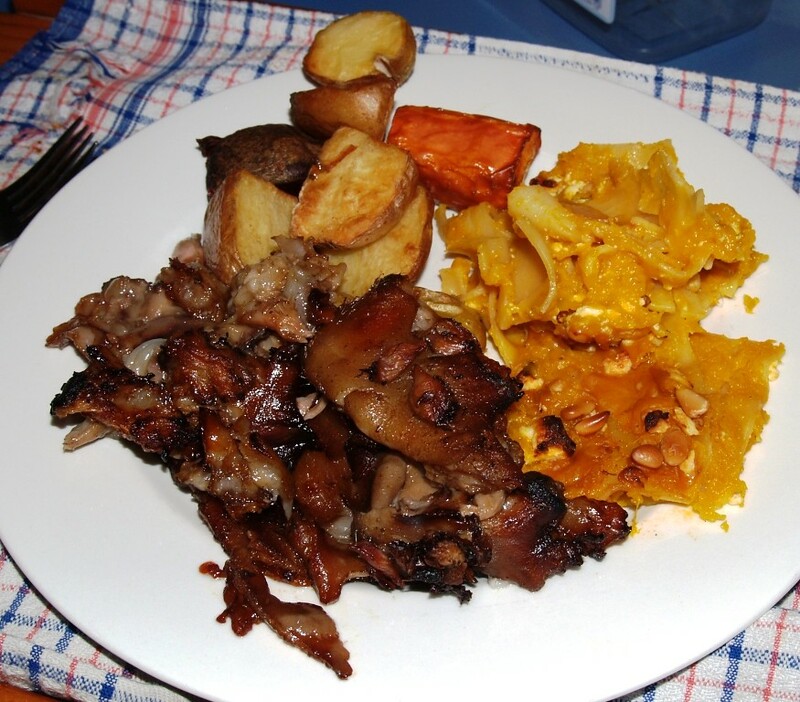 Roasted vegetables with honey baked pigs feet accompanied by a pumpkin and feta lasagne. 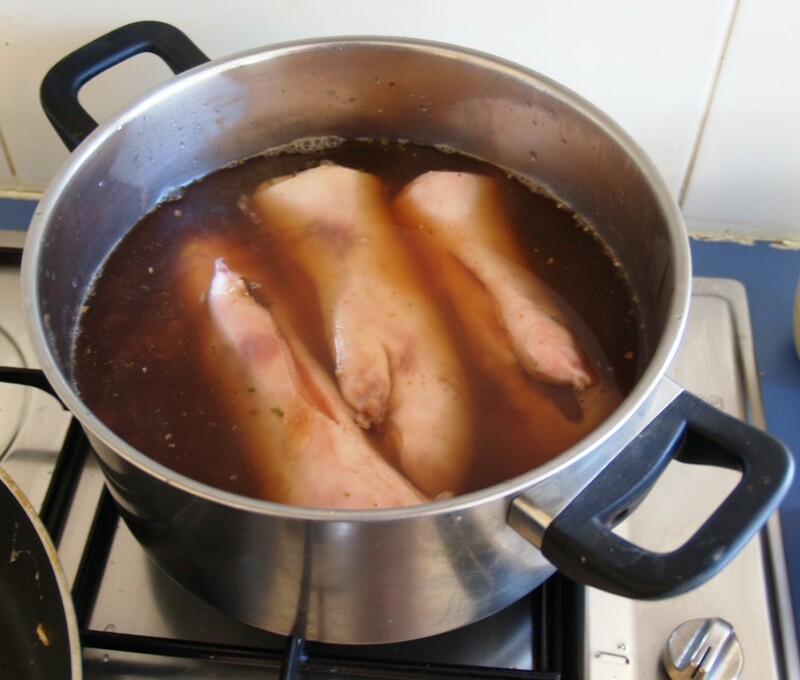 The pigs trotters were washed and simmered for three hours. Make sure the feet are covered. The solution to cook them in was water, a good amount of vinegar to help in the tenderising process, some allspice, paprika and ginger. The meat will fall off the bone. 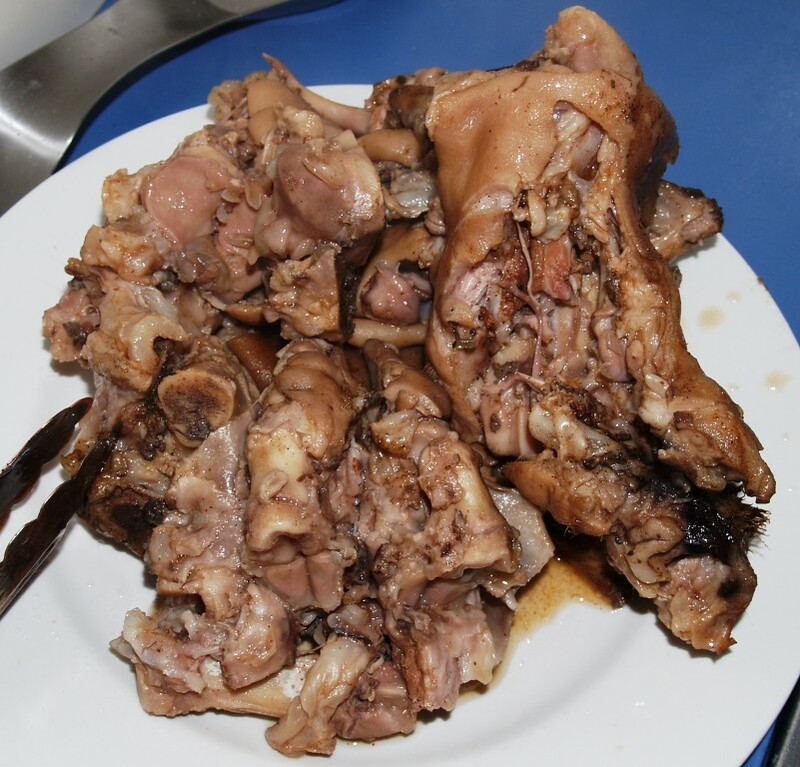 When removing the meat and skin, remove as much rubbish fat as is possible. Place all the rescued meat and skin in a roasting tray. Make a solution of honey mixed with a small amount of hot water to dissolve the honey. Brush the wash over the meat and repeat at some stage during the extra cooking. Roast your vegetables of choice and when there is about thirty minutes to go, throw in the pigs feet meat. Verdict: Yeah I know, it could have used some peas for colour! Pigs feet do not have a lot of meat so if you have only the feet and little of the shank, you might want to add some pork from another stewing cut to boost the volume. The feet are predominately skin, fat and tendons. The meat mix alone would be fine served as a pre dinner snack or nibble but next time I might also get some pork neck to be able to provide a little more. I have read this can be useful to stuff the skin which has been removed from the pig trotter after cooking, and then spiced and tied before cooking further. But that little Toot is another story. Published: Aug 27, 2010 7:37am by shaun. There is a german delecacy called an Eisbein. It’s the knee I think. They are served boiled or grilled. I love them. It’s a big meaty thing but delicious. I’m really hungry now just writing that.